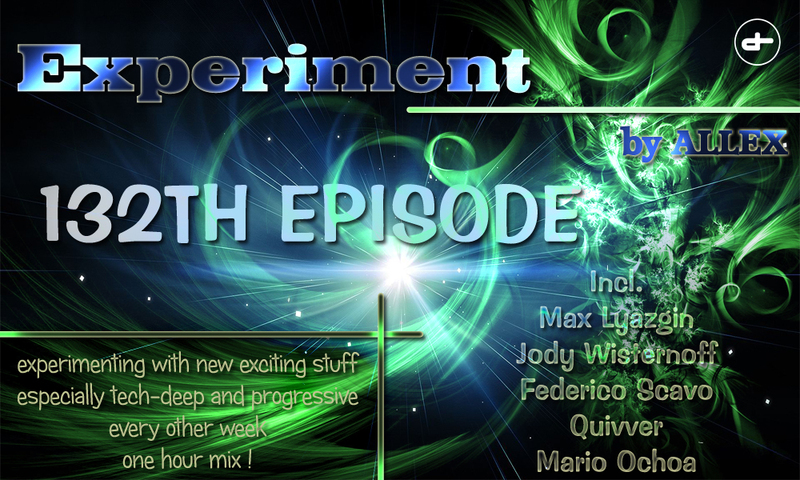 Some new, some old but fresh stuff will be included in this episode of your fortnightly update of deep-tech-progressive house music of Allex’s podcast Experiment! Summer is welcoming us very slowly, the temperature is warming up and we feel it in our mixes as well! Max Lyazgin, Jody Wisternoff, Federico Scavo, Jay Lumen, Mario Ochoa, Quivver or Marco Lys, just a names of few you can expect tonight! So sit back and enjoy! And again it’s time for your fortnightly update of electronic music, mainly deep-tech-progressive or slow melodic stuff ! 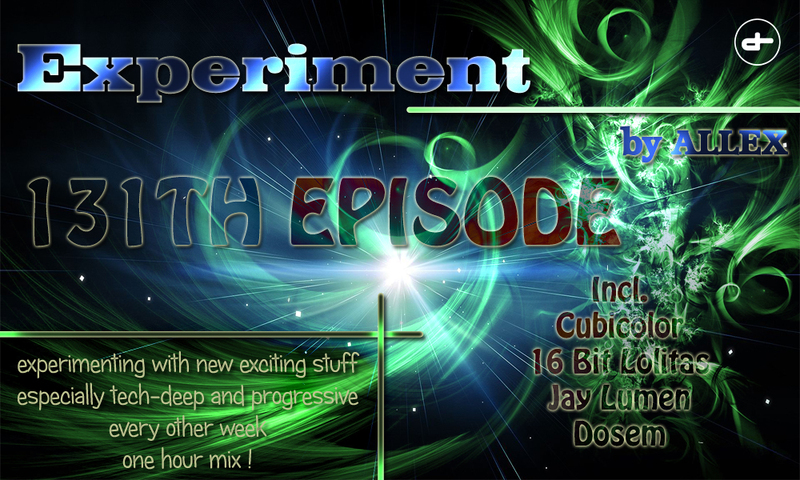 131th episode of Experiment will bring you more melodic music as usual, with tracks from producers such as Cubicolor or 16 Bit Lolitas on Anjunadeep, Strobe, Teenage Mutants or more techy stuff from Jay Lumen, Dosem or Prok & Fitch ! This will be without Allex’s own production but it doesn’t mean anything because he is still preparing some stuff for you ! More great news soon ! Podcastin’ ain’t easy but it’s necessary. For a while after the previous Hausaufgabe I was suffering from a case of mixer’s block. The problem wasn’t a lack of sweet tunes to promote, on the contrary: going through my backlog of unplayed stuff from past months I couldn’t decide what to include. First world problems eh? After some stressing over the subject I told myself to screw it, have fun, go with the flow and all that jazz. Hence I put together set of upbeat house bangers with some hints of techno and Detroit thrown in. 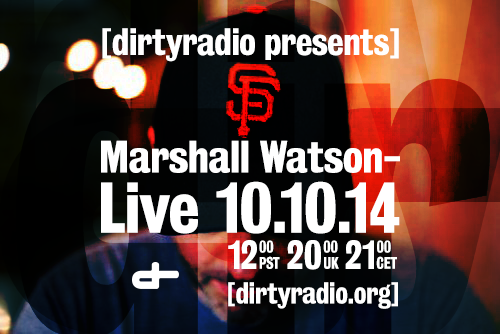 Hector Moralez and Truncate within the same 12-track episode? Not sure if one can get away with this but I’m willing to try. A small note: before you get on my case about the digital distortion creeping out from a few of the tracks, let me assure you it’s not my doing but originating from the releases themselves. As much as I hate to hear awesome music getting downgraded by unskilled (or non-existent) mastering, in these cases I found the issue to be within acceptable limits. Hopefully you’ll do so as well and have a blast with these sounds! Better late than never? Unlike Mr. Astley I’ve let you down by not delivering a new episode prior to the new year as promised. As a peace offer, I hope you’ll accept this lengthy mix intended to make things up and to get 2015 going. It may not contain everything for everybody, but with styles ranging from emo trance to acid and Chicago jacking there should be something for somebody. Once again, thanks to all who have tuned in to these podcasts during the past year. Feedback is always welcome and I look forward to continue pushing forth excellent music as I encounter it. Boom! New episode with sounds for your December. Wait – it’s December already? WTF happened to 2014? It appears I’m hitting the festive season with a mostly fast and upbeat selection of mild randomness, or something. Among the usual house material, you can find some hints of trance, acid, mandatory NYC retro stuff and even some young folks’ genres an old timer like myself couldn’t begin to name. Post-moombahstep maybe? Be sure to check out the fine remix from Somepoe, one of the fine local warriors from our old Oulu hoods. Kärpät! I probably have one more Hausaufgabe in me before the new year, so keep watching this space. In the end I survived, with a dozen gems for your housing needs. One may certainly notice a touch of jazz in this installment, as it seems to be making its way back into house music. As someone who was into that whole nu-jazz craze during the turn of the millennium (for all the 15 minutes it lasted), I can’t entirely object. Perhaps the next episode will be something slightly more uplifting again, perhaps not. Check back and find out. O hai, didn’t see you there. Ready for more Hausaufgabe? But of course you are. Word of warning: this episode is a semi-random “jam session” with a pile of new and old tunes that I found in my hands instead of something more planned out. Yes, believe it or not but usually I try to think about these mixes in advance. As a result we start off with discoish things, get dubbed in for a bit and then bang out some straightforward house stuff. Does it make sense? Probably not, but does it matter with such sweet tracks anyway? You be the judge. The leaves are falling, the birds are pulling a GTFO on us and for once one doesn’t have to enquire about the whereabouts of the drop – it’s right there in the temperature. It’s autumn time again, and here’s a soundtrack sort of matching the season. This episode wanders among somber melodies until stumbling upon more uptempo and retro house sounds and ending up.. somewhere a bit different.